Arrangement of cables that are too tight and irregular can interfere with air circulation between the hardware. Keep in cabling - cable does not cover parts - an important part in the computer, especially the move, such as cooling fans, processor or additional fans which serves to turn the air circulation. Arrange the cable - the cable in order to decompose in a neat and air can freely enter and exit the casing. 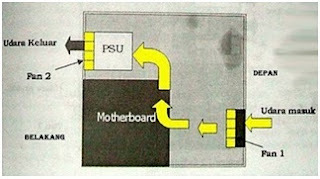 Typically, a cable barrier air flow is that the IDE cable installation is not neat and cover air circulation. For that, you should develop as neat as possible. You can paste it into the corner - the corner of the casing so as not to impede air flow. You can also use the cable - the cable arc smaller and more flexible than the flat cable in general. 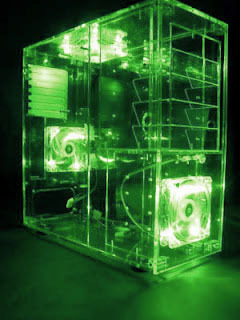 Adequate air circulation in the casing in the casing must be considered because there are components that generate heat. Air from outside into the casing through the fan, then the air inside the casing is removed by another fan. It lasted over - over the air inside the casing so that is always new and experienced turnover each time. Figure 0.1 is one example of mounting the fan to the casing so that the AT will produce a perfect air circulation. 1 fan draws air from the outside to be included in the casing and replace the hot air into the PSU. On the PSU there is a fan that has the function of removing heat. 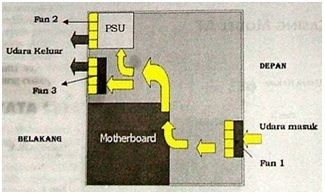 Figure 02 is an example of mounting the fan to the casing ATX model. Fan ATX casing generally possessed more of the fan casing AT. 1 fan draws air and enter it, then hot air in the casing removed by two subsequent fan so that every time there is a continuous process of circulation which would optimize and extend the life of the components inside the casing. In case there are additional Pentium 4 fan from the side. This fan moves out to take the hot air in the casing into the outer casing.